In a medium saucepan, combine milk and butter; bring to a boil. When mixture is boiling, add flour all at once and stir vigorously with a wooden spoon until the dough forms. Continue to stir and cook the dough for about 1 minute. Transfer to a stand mixer (or a large mixing bowl and using a hand mixer on medium-high); beat in the eggs one at a time, waiting until each has been well incorporated before adding the next. Keep mixing until smooth dough is formed. Transfer dough to a pastry bag fitted with a large star tip. Best if dough is fried right away. Pour about 2 inches of oil into a deep saucepan. Bring the oil to about 365°. Once the oil reaches the desired temperature (365°), pipe 5- to 6-inch pieces of churro dough into the hot oil and cook until golden brown, flipping churro around so it browns evenly (about 3–4 minute). Remove from oil and set on paper towel to drain. Dust with cinnamon sugar. 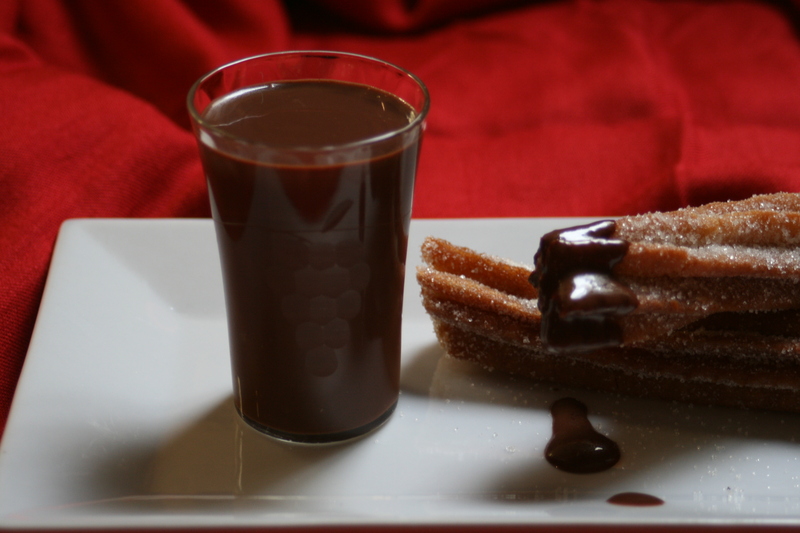 Serve churros with small cups of chocolate sauce for dipping. Add all dry ingredients to the same bowl, including chocolate. Add vanilla to a saucepot with the milk and heavy cream and warm just to a boil. Watch carefully and immediately remove from heat. Pour warmed milk mixture over dry ingredients. Mix well, making sure chocolate is completely melted. (Taste for sweetness. If you decide to add sugar, this is when you will do that, little by little; make sure mixture is still hot enough to melt the sugar, if not, remove a small amount of the chocolate mixture and heat just enough to melt the sugar you are adding, then pouring that back into your base and mixing well. Taste again, repeat process if needed. ) Pour into demitasse cups. Serve hot with churros.